1. More trouble at Uber: Hackers accessed millions of Uber users' personal information last year, but the company did not report the hack until Tuesday. In late 2016, two people outside the company accessed the personal information of 57 million Uber users including names, email addresses and phone numbers. Uber CEO Dara Khosrowshahi said in a statement that he only recently learned of the breach. The startup has been embroiled in a number of recent controversies, including the use of software to evade regulators and a slew of complaints regarding sexual harassment and toxic company culture. 2. Fed minutes: Minutes from the latest Federal Reserve meeting will be released at 2:00 p.m. ET. Investors will be watching for hints on monetary policy, including a possible December rate hike. Fed chief Janet Yellen said Monday that she will step down from the central bank's Board of Governors when her successor, Jerome Powell, is sworn in early next year. 3. U.K. budget day: British Treasury chief Philip Hammond will unveil his budget on Wednesday. The chancellor is under political pressure to soften the impact of years of austerity, but Brexit uncertainty and depleted public finances have limited his options. Analysts predict a cautious budget without any major new spending initiatives. 4. 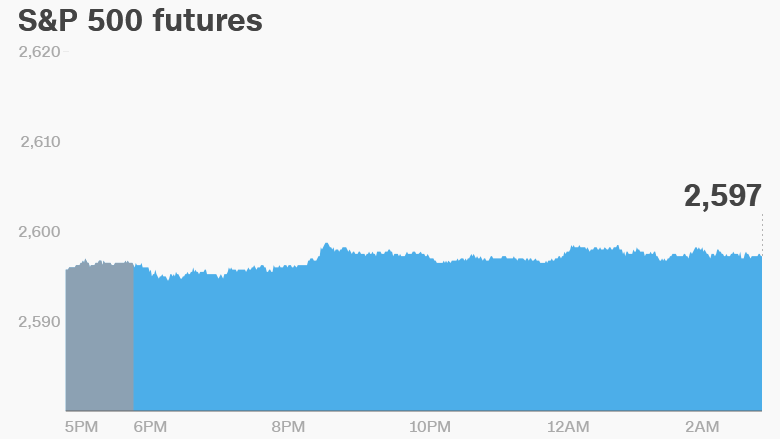 Global market overview: U.S. stock futures were flat on the final day of trading before Thanksgiving. Markets will be closed Thursday. European markets were mixed in early trading. Asian stocks posted gains. U.S. crude futures were 2% higher following disruptions caused by a spill earlier this week on TransCanada's Keystone Pipeline. The three main U.S. stock markets all hit records on Tuesday. The Dow Jones industrial average and the S&P 500 added 0.7%, while the Nasdaq gained 1.2%. 5. Companies and economics: Shares in Hewlett Packard Enterprise (HPE) dropped in extended trading after CEO Meg Whitman announced she will step down on February 1. She will remain on the board. The University of Michigan consumer sentiment index is expected at 10:00 a.m. The weekly U.S. crude inventories report will be released at 10:30 a.m.